I always enjoy the Michaelis Art School’s end of year show, it seems to kick in the summer season and, having spent the entire eighties there myself, is quite nostalgic. When I was asked to be the external examiner for one of their master’s candidates last year, it was with a certain amount of reluctance that I agreed. The art pond is a very small pond indeed. I had done this once before a while ago and had to endure unpleasant “chats” with the candidate as to why I had decided what I had when we subsequently bumped into each other out on the town. I wanted to enjoy my pool and beer rather than talk art…you can imagine. I had declined further invitations since but thought it might be an interesting exercise for this jaundiced art lover. My own lecturing experience had taught me, to a large extent, the ability to engage with and encourage and discuss with students their work and intentions which might fall outside of my comfort zones. This soft approach had hardened since I left the lecturing game …I needed to loosen up. This proved quite easy. My holier- than- thou approach to students and lecturing was unnecessary. The works of Andrzej Nowicki hit me in four of the seven chakras that I can remember, and in percentages that I found more than pleasant. Not too much head, at the end of the day who gives a Foucault how you spell Derrida, a lot of heart, gutsy and just enough groin action. A lot of his references and influences fall outside of the traditional highbrow art context and there is a playful engagement with ephemera from popular culture. You see the influences of contemporary editorial illustration, narrative graffiti and the odd quirky style animation and drawings which remind me of the awkward doodles that we all did in the back cover of our standard 8 Geography books. I was having fun. Not that the influences of the more traditional lexicon of art references are absent though. 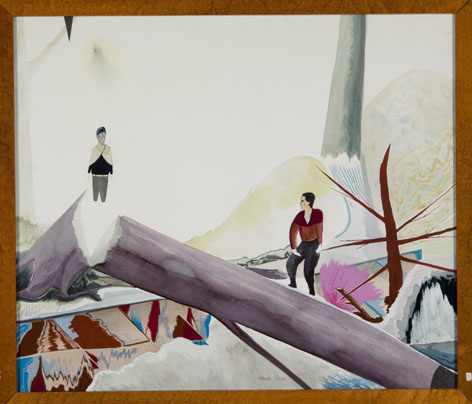 The work of Neo Rauch’s, which Alison Gingras describes as ” the painter of the failed Utopia of the Eastern Bloc”, is present. When first looking at the works, there is an awkwardness of palette and an oddness of spatial construction which seems untrained, clumsy and a little wooden. After spending a little more time with the works, particularly the smaller oddly framed drawings and watercolours; this ham-handedness dissolves into what I see as an intentioned, directed and conscious effort to describe odd disjunctures and ” events” through awkward inventions. These weirdly constructed vignettes begin to play with notions of time, space and historical dating. All traces of ochre, yellow and earthy reds have been reduced to what appears to be a cold Northern hemisphere palette of bleached whites, blues and blacks. The African Identity (whatever that might be) is refreshingly nowhere to be seen and an exotic description of Northern ” otherness” is embraced. His fabulous ectoplasmic squid, out of date computers and Eastern European architecture are reminiscent of 50’s and 60’s comics and Boys Own Annuals. Sci-Fi and B-Grade movies are not far away either. The staged events and peculiar constructions are reminiscent of what is loosely referred to as Outsider Art. The kind of power of intention and drive of expression which is immediately felt in the work of these artists is felt in Andrzej’s work. There is an undertow of violence which follows the characters within these narrative non-sequiturs and, unlike the work of Laylah Ali, is understated and implied. There is a quiet humour which runs through the work and a kind of ” noir” deadpan delivery. The surrealist tradition is coupled with a thrift-store art sensibility, which mocks these highbrow references in a style where contemporary illustrators graphic artists and designers are equal partners with the big name establishment heroes of Contemporary Art. I hear Andrzej has relocated to New York after a sell out show at David Krut in JHB. It will be interesting to see how he does there where the pool is much bigger and his references much closer. I look forward to seeing further results of his compulsion to make uncanny things. P.S I just remembered a 5th chakra…its in the pocket. I walked out of the assessment and asked him if I could buy a few of his works.